Title: Vermouth Bianco, high-life, Isolabella / M. Dudovich. Date Created/Published: Milan : La Presse, 1946. Medium: 1 print (poster) : lithograph, color ; 140 x 100 cm. 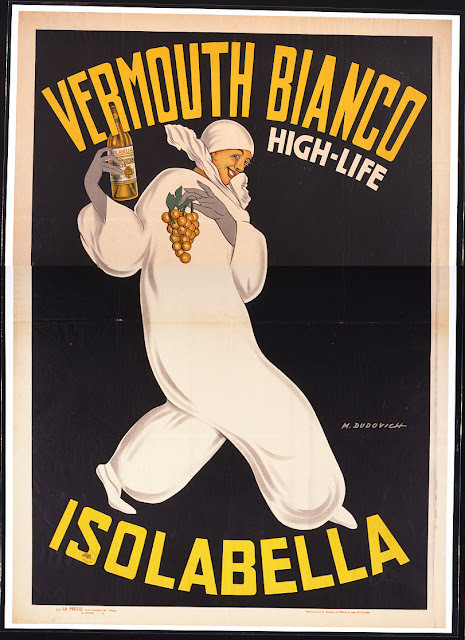 Summary: Advertising poster for vermouth showing a woman in a white clown suit holding grapes and a bottle of the fortified wine. Rights Advisory: No known restrictions on publication in the U.S. Use elsewhere may be restricted by other countries' laws. For general information see "Copyright and Other Restrictions ...,"